As you know my slow cross country vacation started with Miami. I wasn’t very sure about leaving New York for so long. But Miami was surprisingly good. I found this new neighbourhood called Wynwood and It’s very familiar home like feeling to me. It’s very similar to Williamsburg – my home for the last 4 years. But I also quite enjoy Brickell where is more extravagant and luxury in a sense of daily living. I was looking forward to learning more about Pilates for quite some time now. You might catch the idea from my last new year resolutions. Pilates might be the one last thing I wasn’t wholly aware. I was actually quite curious about the machine pilates. I am so lucky that I had a chance to work with Club Pilates to try their revolutionary modern approach to classic methods. And I am very lucky to find one of their locations very close by to where I stayed when I was in Miami. When I received an e-mail about this opportunity that I thought this must be fate. To be honest, I am not so committed to the new year resolutions in the last years. But this time just from the very beginning of the year, I had a chance to start one thing I wanted to do on my list. I had 4 sessions of pilates in Club Pilates Brickell in Miami. 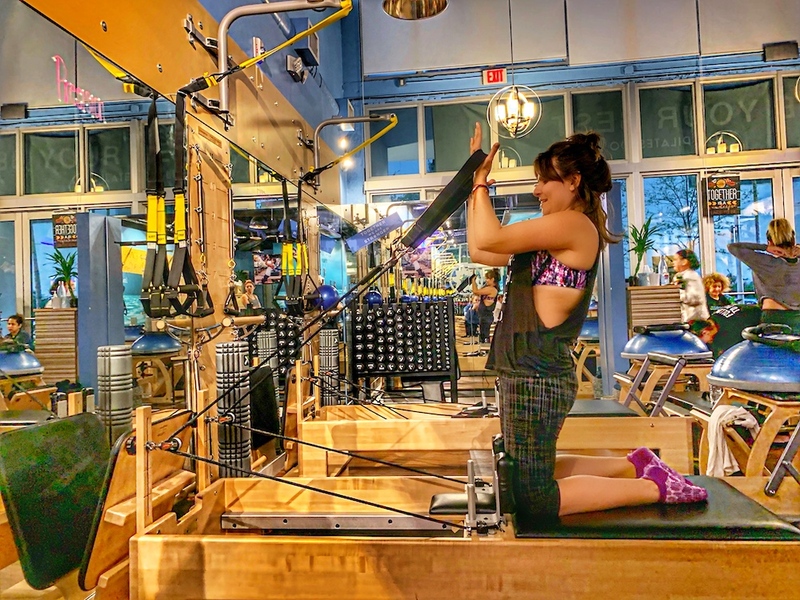 After I signed up to their Complementary Free Intro class I received an e-mail from Club Pilates and telling me how I prepare myself for my first session and how to make my appointments for the classes. I download Club Pilates app. It’s the easiest way to check the schedules of The Pilates Reformer, TRX Suspension Training, Springboard etc. Reserve your spot. Voila! This is easy. I must tell you that I was hesitant to download the app because these apps never actually work always crashes, gives you so many problems with the signups etc. Club Pilates has the best working app ever. It worked smoothly. You know that why I am obsessed about this since you are reading a fashion technology blog. I am always so careful about what kind of experiences I have with the brands and their approach to technology. This is why Club Pilates got the first impression the best possible way without starting even a class yet. I met the loveliest people every day during my sessions. All the stuff and the trainers are so nice and very careful about if you have an injury or something. They want you to get the best possible experience. And the studio is so clean and well put together. Classes were always full which made me very impressed by the diversity of them. There were people like my age and some old people and younger. It really depends on how everybody can take the intensity of the workouts. If you never tried the pilates before and also haven’t worked out lately (I was exactly like that) I suggest you start with CP Reformer Flow which just 50 minutes and you won’t understand how that time goes by. And now, I started to think why on earth I haven’t tried the pilates before. It’s one of the top workouts I have ever had. When I have seen the one in Williamsburg was just around the corner of my old building, I was even more angry with myself. First of all, you can all go and try the Complementary Free Intro class. Secondly, there are packages that you can give it a try to see if the pilates is your forte. And finally, the monthly fee doesn’t break your bank. I can’t tell you how much I loved pilates. And thank you so much Club Pilates to introduce me to this great new activity.